Solar Sales Proposal Software: Solar Electric (PV), Energy Storage (battery), Solar Water (thermal), Energy Efficiency, Wind. USED BY THOUSANDS OF PROFESSIONALS. Software for estimating solar payback, ROI, cost estimate. Finance modeling: loan, lease, PPA. Financial analysis for solar energy, renewable energy. Solar Estimating, calculations, analysis. Solar quote, solar bid in United States and Canada. Trusted by Thousands of Professionals. Building on almost 2 decades of front-line experience working with solar & renewable energy professionals, ONtility ProTM is designed to speed up and enhance the sales process. Easily crunch the numbers, generate professional sales proposal materials, and manage your sales activities. ONtility ProTM helps you focus on what matters: identifying your customers` needs, designing smart solutions, and getting new business on the books. Easily Generate Professional Sales Proposals. Quickly spec out customized solutions, across a spectrum of possibilities: solar electric (PV), solar thermal (water, pool/spa, hydronic floors), wind turbines, energy storage and energy efficiency in the United States, Canada, Caribbean & Central America. Accommodates Net Metering (including Virtual, Aggregated & Nonbypassable charges such as California`s NEM2.0), Gross Metering, Self-Consumption Metering and Feed-In Tariff (FIT) scenarios. Produce accurate performance and pricing estimates that reflect current energy rates, incentives and rebates. Show your customer "the payback": Easily run comprehensive financial analysis and compare finance options (cash, loan, lease, PPA). CRM features and APIs to help manage the process and close the sale. Includes a PV Layout Tool: define buildings, installation areas, keep out areas and obstacles. The Solar PV Layout Tool auto places PV modules, creates sun path shade views, provides 3D views and more! Includes a Sales Lead Widget you can place on your website and use in the field to provide ultra-quick estimates. Leads generated from the Widget are auto-inserted into your account. Available wherever, and whenever, you want it. Securely streamed to your browser. Sample Sales Proposal : an example of what you can produce in minutes. Intuitive, user-friendly and driven by powerful software: You'll quickly be up and running. No software to install or maintain. Always available, always up to date. Access anytime, anywhere via your internet browser on a tablet, laptop, or desktop computer. Energy efficiency and renewable energy systems can be great investments. Size smartly and build customer confidence by taking your customer's desire for financial well-being to heart. ONtility ProTM helps maximize your customer's investment efficiency. Size systems intelligently - go beyond the simplistic notions of "tier shaving" or "percent-of-energy" when sizing energy systems for your customers. Easily compare energy rates and finance options (cash, loan, lease, PPA) to see which may best serve the customer and help close the sale. PV Layout Tool allows one to define buildings, installation areas, keep out areas (such as skylights or chimneys) and obstacles (such as trees). 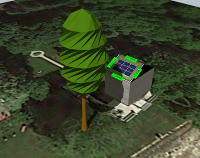 The Tool will auto place PV modules, create sun path shade views, allow 3D views, export images, and more! Is ONtility Pro Right For Me? Solar, wind and energy efficiency dealers, installers, contractors and marketing/sales professionals. Consultants, architects and designers in the renewable energy and energy efficiency fields. Financial advisors and due diligence personnel assessing and justifying the financial viability of renewable energy and energy efficiency projects. Contractors, electricians, plumbers, roofers, HVAC, hydronic radiant floor, window, insulation, pool, spa and other service professionals entering the renewable energy and energy efficiency markets: Performance estimation and pricing guidance is provided to help you avoid costly mistakes.